When I set off on this journey, it was with a certain mental picture in my head. I hoped to find off-the-beaten-track places, meet local characters, listen to some great music and find some delicious local foods. Never would I have guessed that I could find all of those things in one place at one time, but that's exactly what happened when I walked in the door of Priddy's General Store outside of Danbury, North Carolina. I had found Priddy's on a really great website for the North Carolina Blue Ridge Music Trail, but I didn't know what to expect as I drove down Sheppard Mill Road out of Danbury. About two miles out of town, an old white wooden store came into view. The lights were on and there were fires burning outside and I knew this must be the place. As I walked from my van through the cold winter night, the smell of something good cooking and the sounds of sweet bluegrass filled the air. It made me smile before I even walked in the door. When I did walk in, I felt like I had stepped back in time. Old wooden shelves were stacked high with jars and jugs and any number of other things. As soon as I got there, I met Jane, whose grandfather had bought the store way back in 1929 (it was built in 1888!). Priddy's still operates as a general store from Monday to Saturday, 9 a.m. to 6 p.m. They carry everything from beer to brooms to boots and what seemed like everything in between. Jane welcomed me in, told me some of the history of the place and said she wanted me to feel like I was at home. I already did. I bought a bowl and took it outside to where Jane's husband, Lee, ladled hot, steaming Brunswick Stew from one of the cast-iron kettles bubbling over the open fire. I took my bowl back inside, bought a bottle of Cheerwine and a "dried-apple pie" and pulled up a seat to listen to the music. The food, the music and the genuine country store atmosphere warmed me up, body and soul. The band that was playing, The Last Minute Bluegrass Band, were all local to Stokes County, and they were really good. They also welcomed several other people from the crowd to sing or play a few songs here and there. This was an intensely local music scene and shows how deep the musical tradition is in this part of North Carolina. When the band would play a particularly upbeat song, the crowd would clap along and several people would get up and dance. When they did, I got a look at something I had never seen before: flatfoot dancing. Flatfoot dancing has its roots in Irish and Scottish dancing, but is unique to the mountains of the southeast. Some of the flatfoot dancers were wearing boots, others were wearing special shoes which I assume were tap shoes. Between the clicking and clacking of the dancers, the music of the band and the clapping along of the crowd it would have been really hard to not have fun and join in. I got to talk to several people throughout the night who were as curious about me and my journey as I was about them. One of the people I spoke with was Dave who was 74 and had lived in the area his whole life - just a few miles away. He had bought and run a tobacco farm for many years and had been coming to Priddy's since he was a kid. He had watched Jane and many of the other people in the room grow up and have kids of their own. 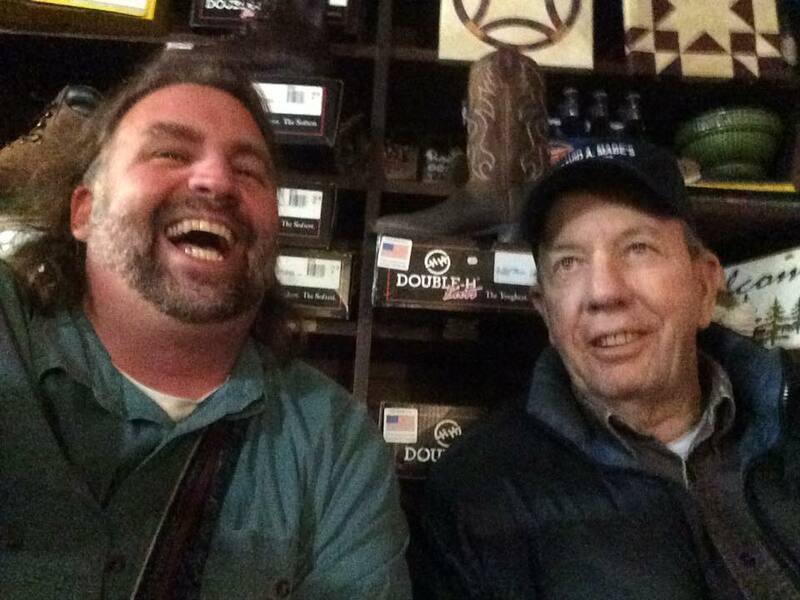 Dave told me a great story about how when the store had started hosting these bluegrass shows, people danced and stomped so much that the bottles in the back room danced right off the shelves and crashed to the ground. He had helped drag an old telephone pole in and they had jacked up the whole building and put it under the floor for more support. There hasn't been any problems since. We talked and laughed until the music ended, probably around 10, and then we said our goodbyes as he headed home. After the show, I stayed and talked a while with Jane and Tory Mabe who runs the tourism department in Stokes County. I even got to try some "hoop cheese" a special kind of cheddar made only in June and only from grass-fed cows milk. Jane told me it's not too sharp and not too mild, it's just perfect. She was right. Finally it was time for me to head out. I wanted to get to Mount Airy for the Merry-Go-Round show on Saturday morning, so I had to say my goodbyes. Everyone made sure I had their phone numbers in case I broke down on the way. And with that, I hopped in my van and with one last glance of Priddy's in my rearview mirror, I headed on down the road. Jane had told me she wanted me to feel like I was at home, and thanks to her, her family and all the great people from Stokes County, I can honestly say I did. When you find a place that you walk into as a stranger and leave as a friend, you know you've found somewhere really special. If you're ever in Stokes County, be sure you stop in to Priddy's General Store and say hello. Pick up some hoop cheese and chat for a while. The music only happens on Fridays in February and Saturdays in October with a few other shows from time to time, so definitely check out their schedule HERE so you're not disappointed. If you can make it out for a show though, you definitely should. As a lifelong traveler, tour guide, music and food lover and now travel blogger, I can tell you that you don't find places like this very often. I went out of my way to get there, you should too.